This page provides two charts that plot the quality ranks of North America's six major automobile manufacturers - Toyota Motor Corporation, Honda Motor Company, Nissan Motor Company, Ford Motor Company, the Chrysler Group, and General Motors Corporation. Each chart employs a different method for computing the quality rank of the manufacturers. 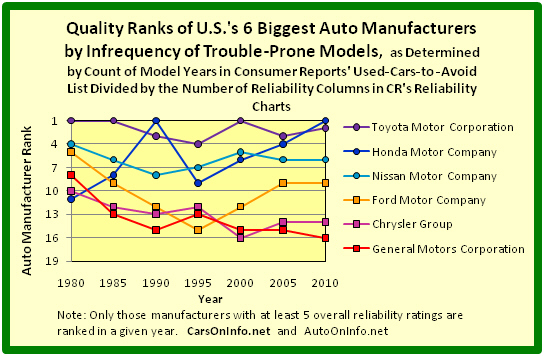 The first graph provides the ranks of the above 6 car makers based on each manufacturer's infrequency of trouble-prone models. These ranks provide a measure of how well each manufacturer's models successfully avoided the bottom end of the model-quality spectrum for the years 1980, 1985, 1990, 1995, 2000, 2005, and 2010. 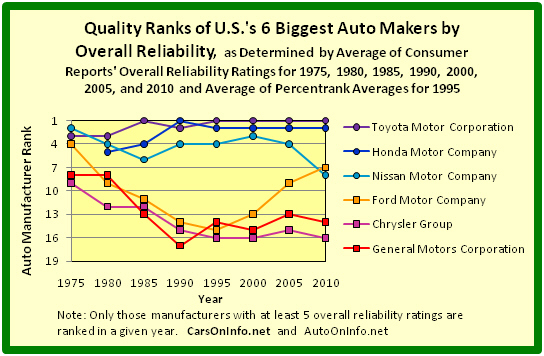 The second graph provides the ranks of the above 6 car makers based on the average of the overall reliability ratings of each manufacturer's models. The second ranking provides a measure of how well a manufacturer's models performed over the entire model-quality spectrum in each of the years 1975, 1980, 1985, 1990, 1995, 2000, 2005, and 2010. General Motors Corporation encompasses its now bankrupt predecessor, renamed in GM's 2009 bankruptcy proceeding as Motors Liquidation Company. The quality ranks of the above six automobile manufacturers by these computations are given for each of the above years in the first graph below. The quality ranks of the above six car manufacturers by this set of computations are given in the second graph below. 1. Only Toyota Motor Corporation has had consistently high quality rank by both measures of quality. 5. By both quality measures, Ford ranks much higher than GM and Chrysler in 2010, but quite a bit lower than Toyota and Honda.